Welcome December, with all your hustle and bustle; with your beautiful lights and warmth of spirit! 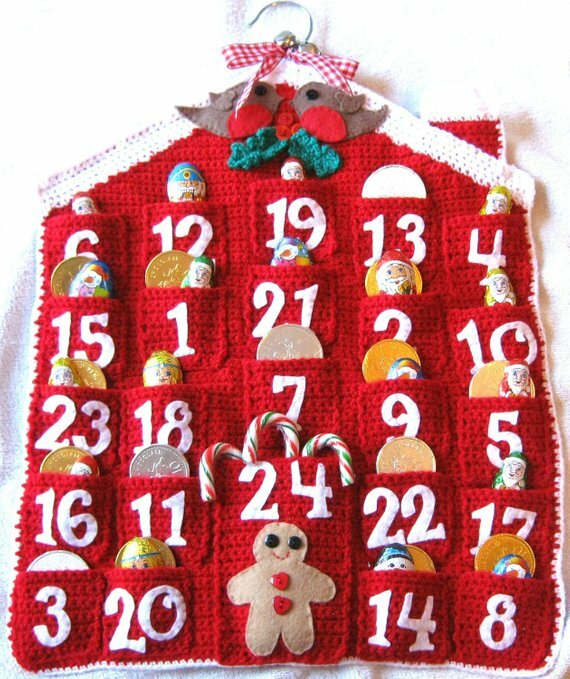 Here, as every year on Fallen Star Stories, December also means one very exciting thing for me....it's time for Mary's Advent Calendar of Books! 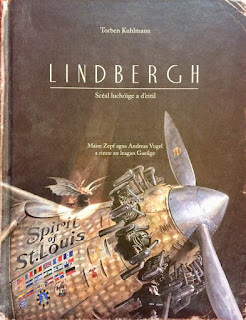 Once again, each day I will be choosing a book to post. It may be a Christmas book or a winter book or something reflecting the joy and wonder that I truly hope this time of year brings you. This is my wish for you....step out of the stress that inevitably comes with this time of year & have a read. The page, Mary's Advent Calendar of Books is open....right about.....NOW! We are delighted to present our brand new, designed just for us....BOOKELVES18 logo. Isn't it fantastic? 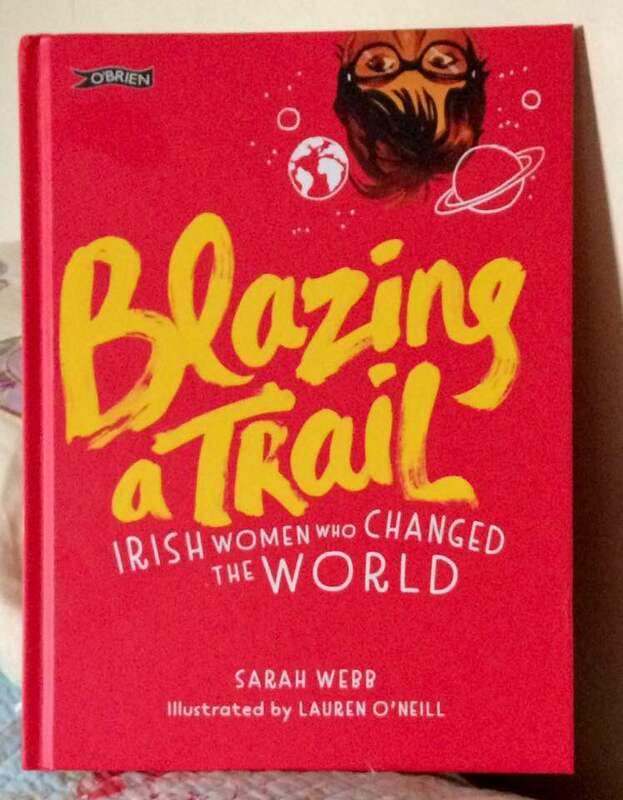 This logo was designed by the wonderful Irish author/illustrator/designer Alan Nolan. He took the time out of his busy schedule to come up with this logo so that everyone can locate us and the BookElves18 can get our bookish message out there. I think it's fun, seasonal, original and intriguing. Many, many thanks to Alan! So, if you are looking for the BookElves18 this season, just look for this brilliant logo and you're sure to find us. We will be posting on Facebook (@BookElves18) , Twitter (#bookelves) and Instagram (@bookelves18)... and it all starts TOMORROW!!!! p.s. Don't forget, the BookElves18 will be live online during The Late Late Toy Show here in Ireland. If you are in a location in the world where you can't tune in, you can still follow the BookElves18 for updates and book recommendations. Just look for the BookElves logo. For more about Alan....follow the links below. Every year at about this time, something truly magical happens. The BookElves appear! Throughout the year, they are working hard, gathering information, checking and double-checking, learning everything they can. Then, at the end of November, they emerge filled with excitement; ready, willing and able to bring you the very best books for children of all ages. 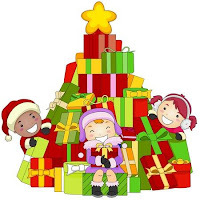 So if you are looking for a special, lasting gift for that special young person in your life; if you have questions or need advice, call on the BookElves18. We know the book you’re looking for! It all kicks off 29 November! But where do I find these magical creatures you ask? 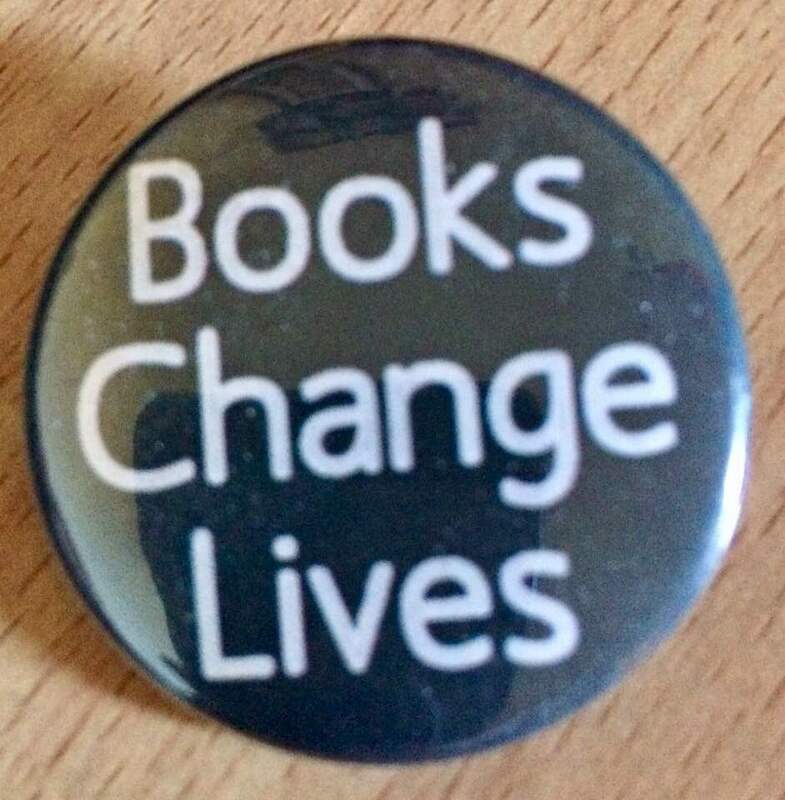 You can find us on Facebook @BookElves18 and on Twitter (#bookelves18) and Instagram @BookElves18. That simple! This year we are posting across three social media platforms to make it easier for everyone to find us, check out our recommendations and ask your kids books related questions. Just tag us or hashtag us and we'll be there. Also...this year the BookElves will be Twitter LIVE during The Late Late Toy Show, which will air on Friday, 30 November. 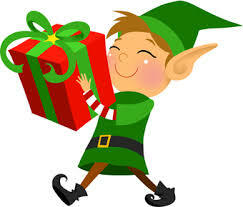 Those of you not in Ireland (and perhaps not having had experience of the Late Late Toy Show...it's a really big deal! ), you may not be able to tune in. BUT...you can join the BookElves18 as we post online with recommendations, comments and answer your questions. So you won't miss a thing! So....get ready! The BookElves18 are coming!!! And we'll here from 29 November through 20 December. 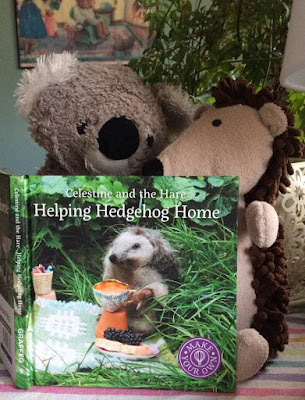 Real Heroes, Adventures and Wildlife! Here are a few of the more note worthy books on real heroes, true adventures and the wonderful wildlife that surrounds us...all published in last two months, just in time for the gift-giving season. And right here in Ireland. This fabulous book highlights 28 of those fabulous Mná na hÉireann, telling a different story each time you turn the page in clear concise language to make it perfect story time fare. 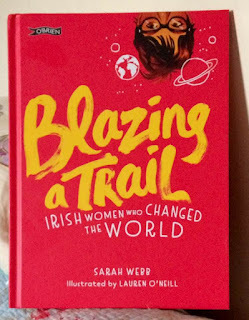 Younger bookworms will especially appreciate the access to the fascinating real-life tales of these icons who changed, not just Ireland, but the entire world. Each page also features a beautiful illustration to accompany the 'woman of the page.' From prospectors and adventurers; actors to rebel leaders, educators to politicians; each brief biography is more fascinating than the last. 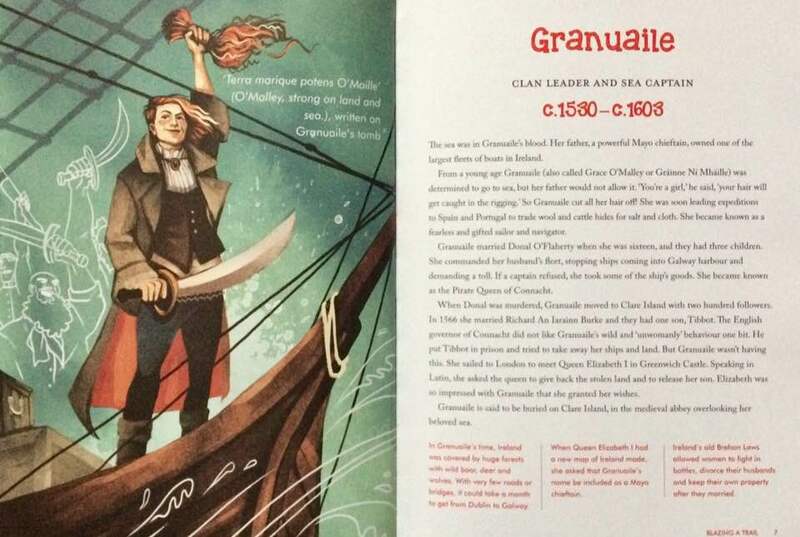 And to make it even better (in my eyes), the stories begin with my favourite trail-blazer of Ireland, Granuaile (Grace O'Malley), the 'Pirate Queen'; sea captain and clan leader. This is a book that will not spend much time on the shelf, as you will spend hours glued to the page. 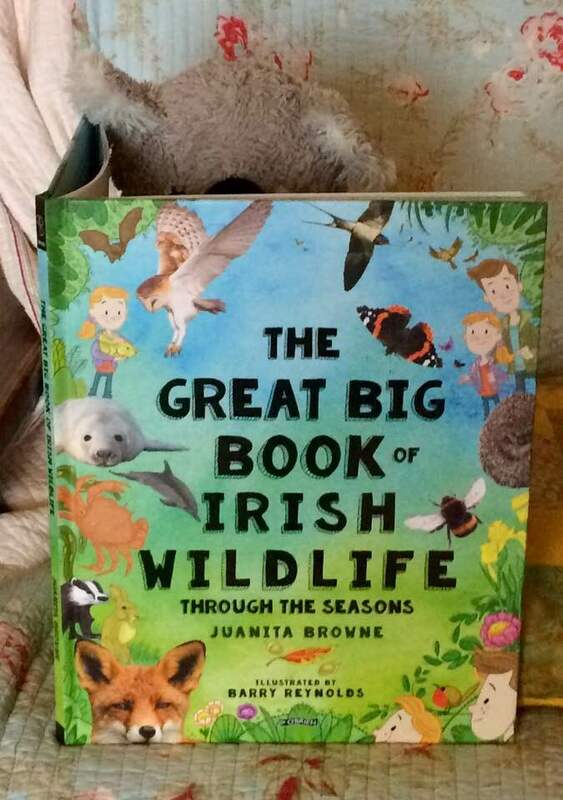 On a journey through the seasons, the wonder of Irish wildlife is filled with facts and bursting with life! Discover the numerous different habitats and the great variety of creatures that live in them. It begins in spring, as the animals that have been hibernating wake up and the trees begin to bud and flowers bloom. Search through the boglands in summer and find the daily adventures of life there. In autumn, see the amazing spectacle of changing colour. Winter doesn't put an end to the activity, as migrational birds land to visit our temperate shores. Each page has information, clear, fascinating photographs and fresh, fun illustrations. 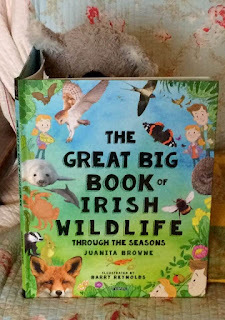 If you want to encourage a true appreciation of the natural world in Ireland, this is the book for you! 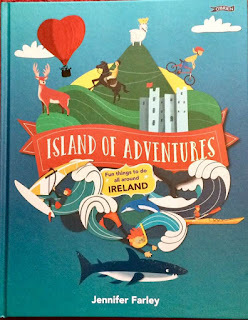 This stunning picture book is designed to appeal to the youngest readers, both here in Ireland and visitors. 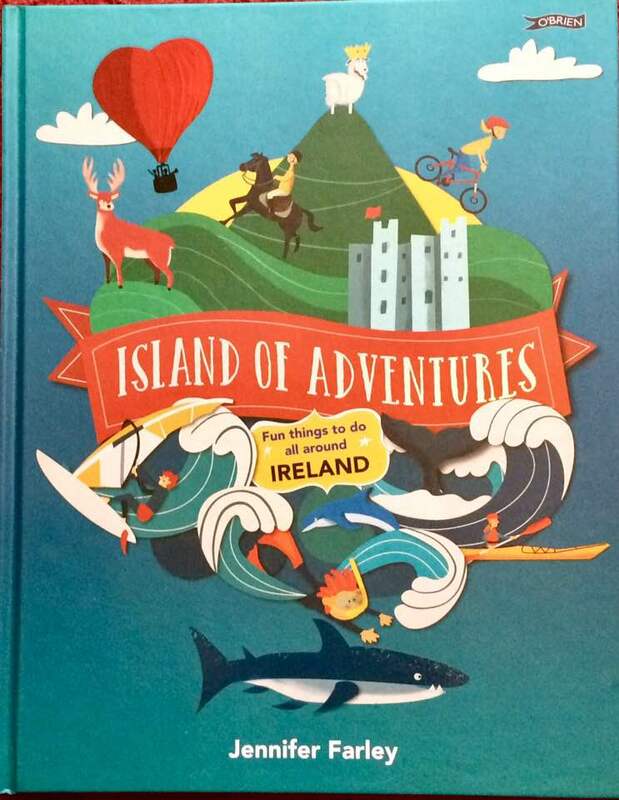 We are taken all across Ireland, with all the fun and exciting activities and adventures it has to offer. Go deer-spotting in Phoenix Park in Dublinl; take in a colourful St Patricks' Day parade; visit Skellig Michael, that wild and rocky outcrop of an island off the wild Atlantic coast in Kerry; ride in a hot air balloon; go surfing; how about some seal spotting; visit an observatory...the action never stops. The lively, vibrant illustrations are spread across each page and really bring it all to life. With lots of detail and attention, this is a book to ponder and dream through time and again. Colourful, charming and intrepid; there are so many fun things to do wherever you go in Ireland. 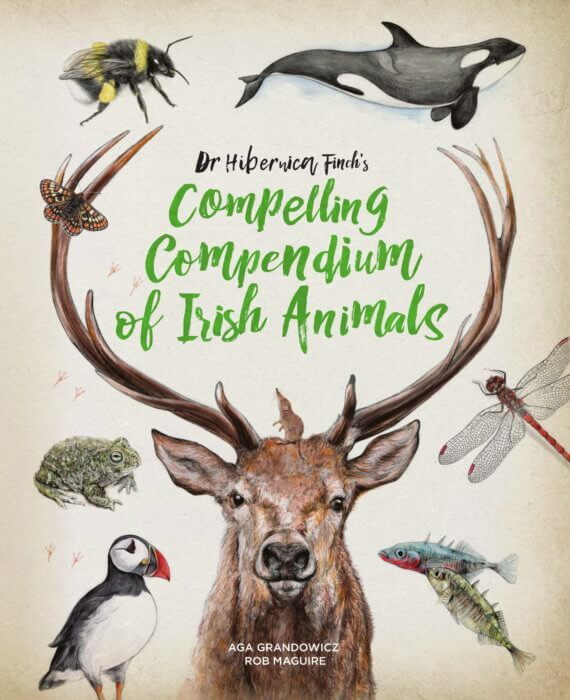 Dr Hibernica Finch may be a fictional zoologist, but the marvellous animal that can be seen throughout Ireland certainly are not. 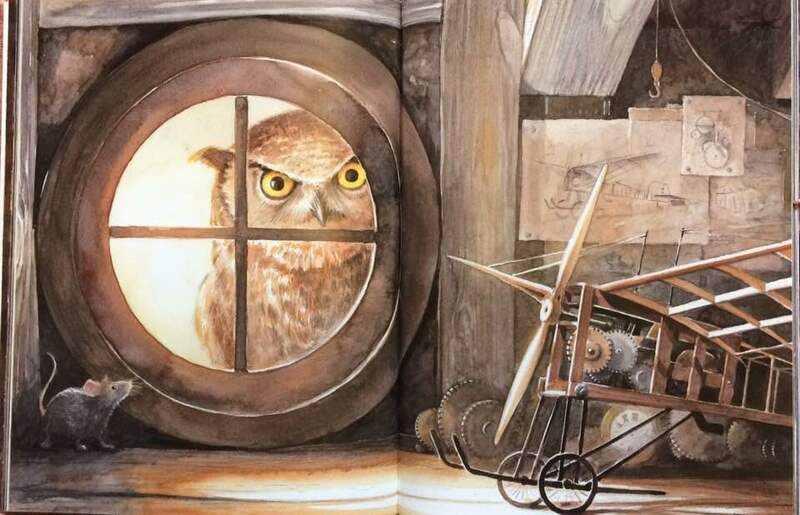 The illustrations are exquisite, subtle and beautifully illustrate a vast array of wildlife. From the delicate dragonfly to the proud, strong and graceful stag, these illustrations do not miss out the accuracy normally found in photographs. 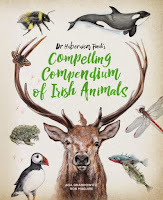 Fish, fowl, amphibian and mammal life all could walk off the pages of this stunning book. One for the entire family to love and to share. That's just a taster of the marvellous nonfiction books available for you. They are my favourites. What are yours? Before I begin, I need to apologise. My Irish is appalling...no seriously...very poor indeed. 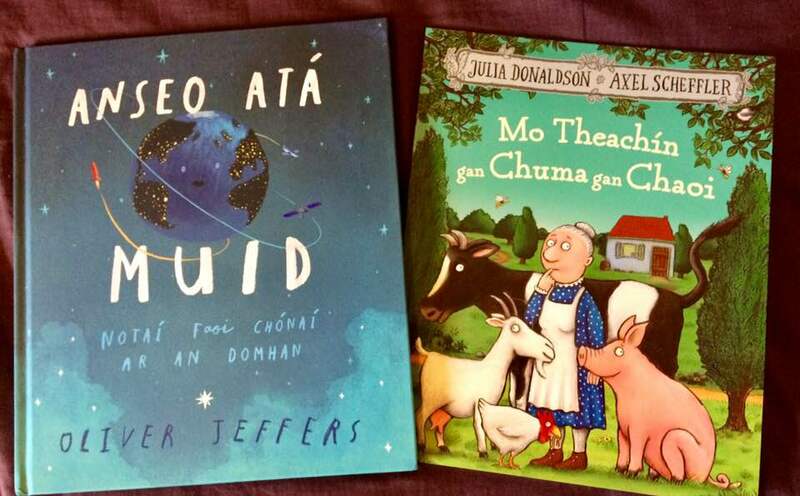 That's why I am so grateful to Futa Fata for sending Irish language books to me for review that either are accompanied by English translations or (in the case of the above) are so familiar that they need no translation. (But thanks to my fluent grandchildren, I can check it out.) Translating books from one language to another is no easy task. Nothing translates literally and it takes a lot of care and attention to get the content and feel of the book just right. Fortunately, this particular publish is highly expert at doing so.But enough of this. Let's move on. 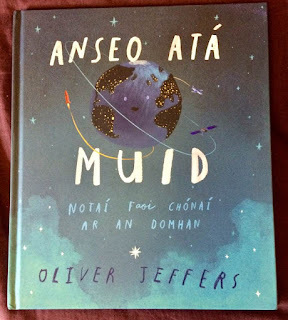 Yesterday marked the launch (at the Armagh Observatory and Planetarium in co. Armagh) of Anseo Atá Muid: Notai Faoi Chónaí Ar An Domhan by Oliver Jeffers. 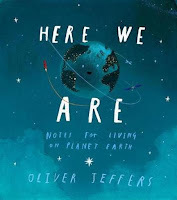 Also known as Here We Are: Notes For Living On Planet Earth; this is a stunning and moving picture book inspired by a new addition to the Jeffers family. 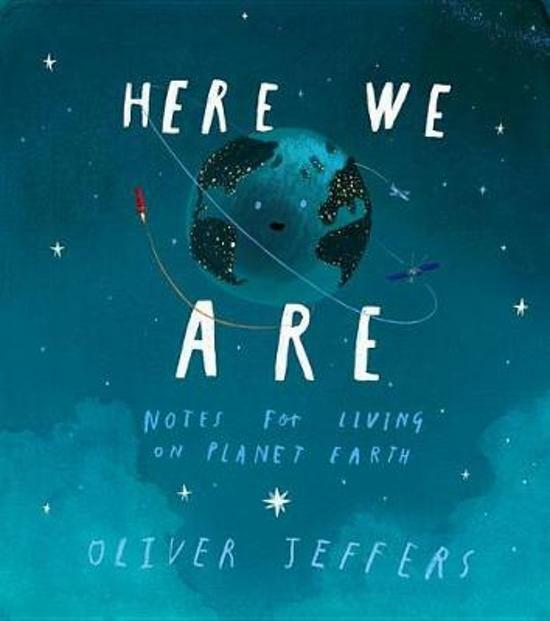 With childlike wonder and insight, it welcomes us all to the planet, explains our physical place in this great, wide world (and beyond) and expresses the interconnection of all things. It gives the reader a view of the external and internal universes and expresses a feeling of care and concern for the environment. 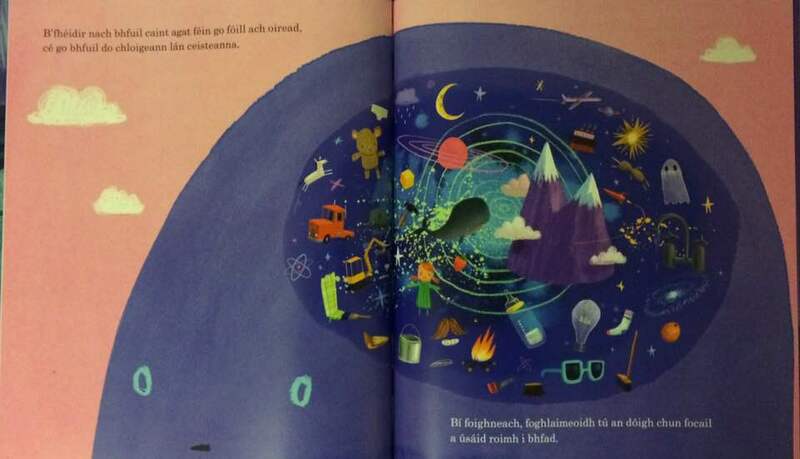 The illustrations are fresh, free and expressive, with completely amazing full-page spreads throughout. This book is a complete joy. 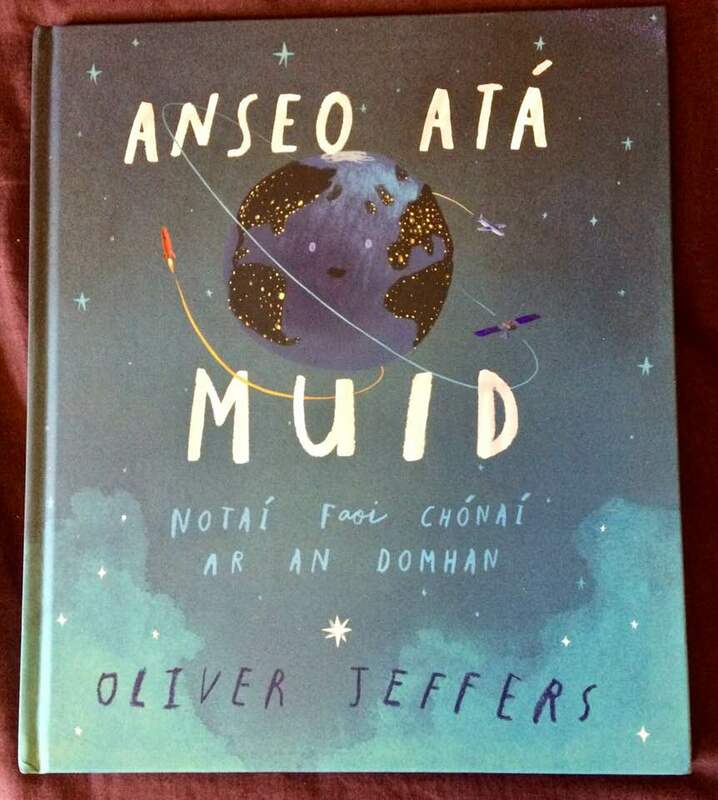 Thought-provoking, poignant and thoroughly entertaining at the same time, I was extremely excited to see it published as gaeilge. What a beautiful way to explain where we fit in the grand scheme of things! But I can't stop there! 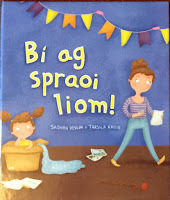 There are a few more leabhar as gaeilge I want to share with you. 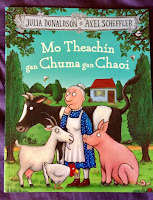 Out now....Mo Theachín Gan Chuma Gan Chaoi by Julia Donaldson; also known as A Squash and A Squeeze. This beloved picture book needs no introduction or explanation. 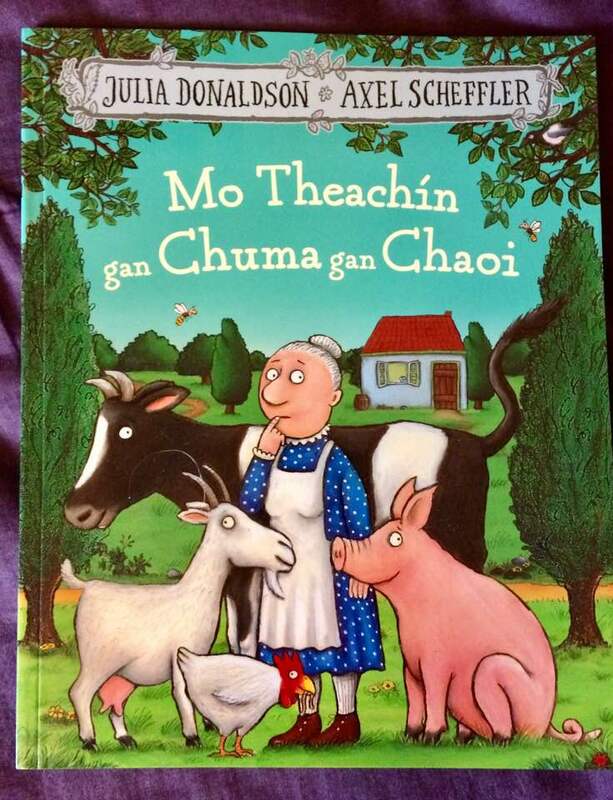 The same familiar story; the same exceptional illustrations by Axel Scheffler and how completely wonderful it is to have it now available in the Irish language! 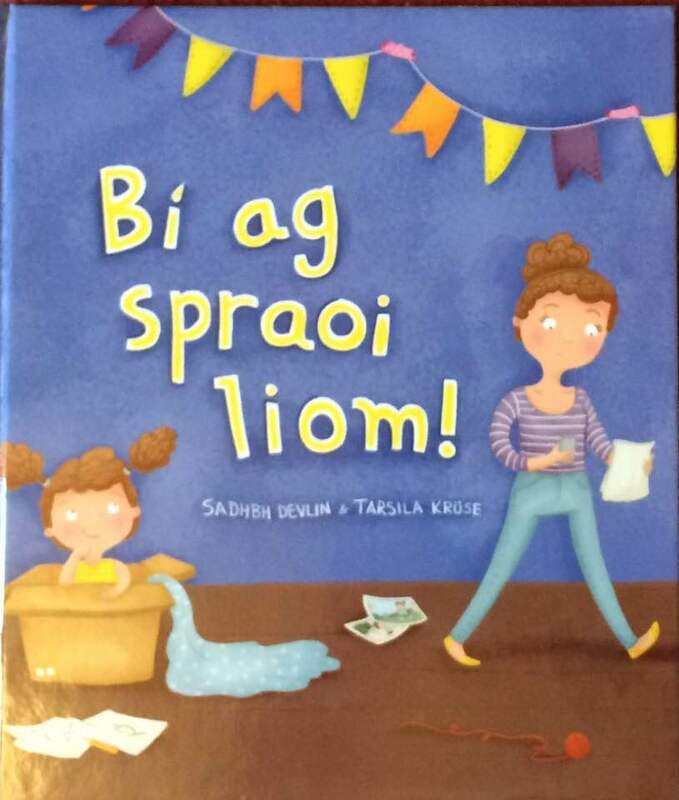 Having books like this one in translation brings excitement, adds comfort and encourages use of the Irish language in the home and by the very young. It even promotes and encourages people like myself, who love nothing more than sharing a story with children, to work a bit harder on my language skills. I loved this book! The story is dynamic and absorbing with fascinating detail. But the illustrations! Oh the illustrations! Detailed, inventive, exquistely executed; they set a true picture of time and place, of mood and atmosphere and of utter wonder. It is magnificent! Bí Ag Spraoi Liom! 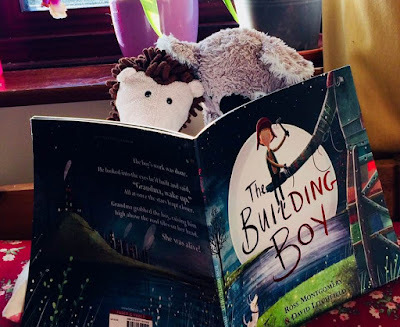 by Sadhbh Devlin & Tarsila Kruse is the heart-warming story of a little girl named Luna and her very busy Mum. All Luna wants is for Mum to play with her. But Mum has to finish her meeting first. It takes sooo long! Luna would also like to meet 'Little Mum', so she runs off to 'Long Ago'. When Mum finishes her meeting....where has Luna gone? A beautiful tale that encourages parents to remember what it's like to e a child and to make time for play....always! One of my absolute favourites is the brilliant Mise Agus An Dragún by Patrica Forde and Steve Simpson. 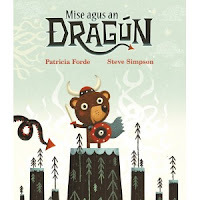 Brave little Bear is determined to hunt a dragon. He has everything he needs; the knowledge, expertise, all the right tools....as long as there are no dark forests or smoke from the dragons' fire...and as long as its' not too scary. So off he goes on his quest, where he discovers how very brave he can be! I'm going to leave you with these (for now.) There are many, many more fantastic books for children in the Irish language, both original (as they last two are) and in translation from other languages. And it's exciting to see more and more all the time with this kind of quality and representation. A personal thank you to Futa Fata for supporting me in my quest to bring new, exciting and different books to you all out there in on the world wide web; and for bearing with my lack of the language. And thank you for delivering the beautiful new picture books in translation! Perhaps many of you have little or no Irish? It's a beautiful and rich, expressive language that you should know more about. And picture books are a brilliant way to learn; especially books like these. 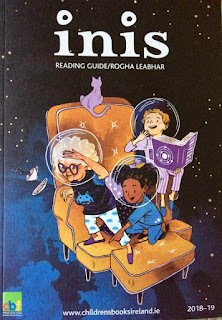 In September each year, Childrens Books Ireland (CBI) launches its' annual reading campaign with the publication of the Inis Reading Guide. 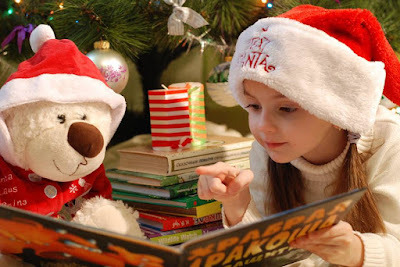 All ages, reading abilities, genres and interests are addressed with hundreds of reviews and recommendations from childrens books experts, presenting the best of childrens books. I am always excited to take part in the incentive, as I know all of my colleagues are. 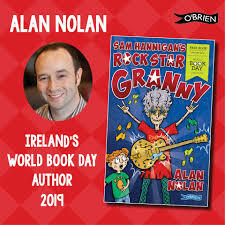 Throughout October, this is celebrated with authors/illustrators/storytellers visiting schools, libraries, bookshops and literature fairs and festivals across Ireland to emphasise the importance and the joy of reading for children. And as we enter the cold, dark winter months (with the holidays hot on our heels and the quandaries of gift-giving even more present), the gift of 'Sharing A Story' takes on a greater importance. 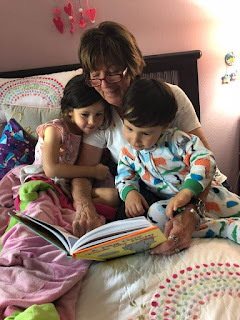 My sister reading to her grandchildren. One picture is worth a thousand words. 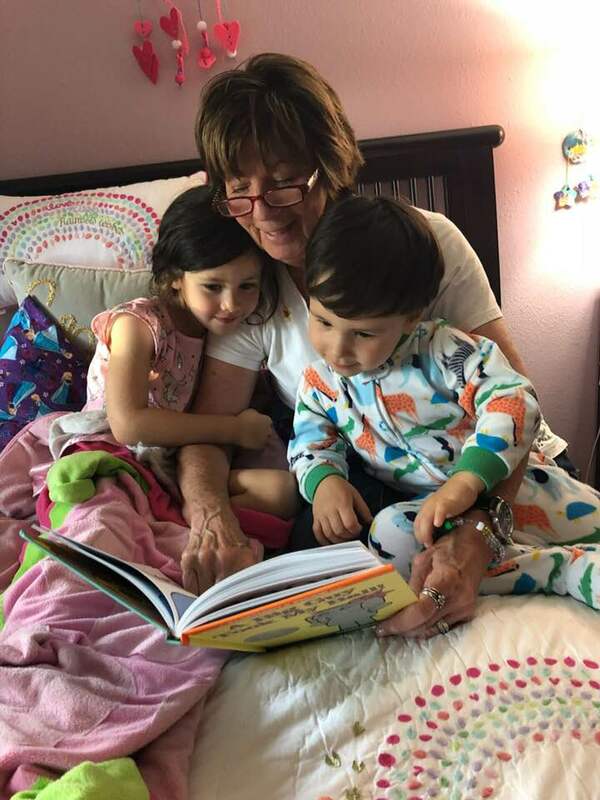 This year, the theme of CBIs' reading campaign is "Share A Story", particularly celebrating the bond between grandparents and grandchildren and the importance of cultivating the relationships across generations. I was delighted to have some reviews included in the specially-curated section at the front of the guide designed to highlight this inter-generational relationship. It is fun, thoughtful and filled with wonderful books for every age level that create a path between young and old. While so many books seem to push the parent-child relationship to one side; parents do have a tendency to get in the way of a good story with their worries, rules and regulations and the 'busy-ness' of providing sometimes obstructs the importance of just being present. The relationship between young and old appear with great frequency. They have much to give each other; knowledge, experience, energy, courage and fun. The older and younger show great interest in each other lives, their experiences and their needs. This is to be nurtured and encouraged, for this interest benefits both in so many ways. For children, they can learn empathy and gain understanding, develop their innate curiosity and get a sense of history, both personal and global. For the grandparents, it enlivens them, creates better health (physically and mentally), relieves loneliness, enhances a sense of self-worth and helps develop a sense of 'what is happening now and what happens next. The bond created and the love shared is an amazing thing to see. And confidence is gained by both. This can be seen, not just in the act of sharing stories in the presence of each other, but in the stories themselves, which is important as so many grandparents and grandchildren don't have access to each other on a regular basis...they can be quite isolated from each other in the contemporary world. Books are a way to close that gap and bring a greater understanding and consideration; a greater compassion into what can seem to be overwhelmingly busy times. But there are so many more wonderful books in the Reading Guide; so many wonderful books to share with each other. If you want a copy of the Inis Reading Guide of your own; and it is an extremely valuable resource to have; you can check in your local bookshop or follow the link below for the Childrens Books Ireland website, where you'll find this guide available and so much more! Now....what book will you share today? There's no time like the present.